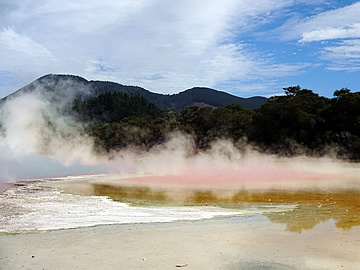 The geothermal landscape is fabulous - amazing colours - and we enjoyed learning more about the Maori culture. 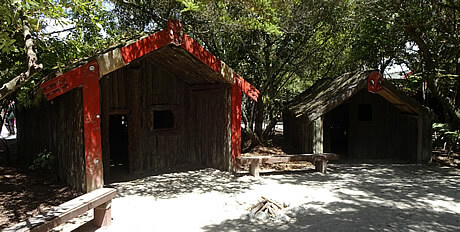 Driving down from the Coromandel Peninsula we skirted the Bay of Plenty, named by Captain Cook as he sailed past in 1769. we arrived around 2pm so decided to pay a visit to the Buried Village before checking in to our hotel. 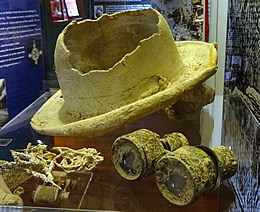 Excavated items from the village. 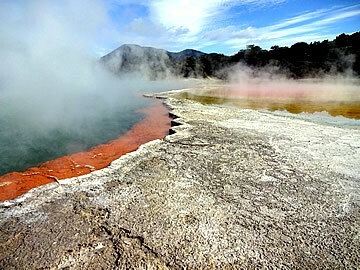 The Maori village was devastated by the eruption of Mt Tarawera in 1886. 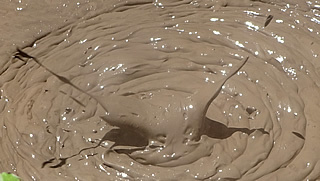 Several buildings, including a hotel and houses (whare), have been excavated, with some reconstructions. 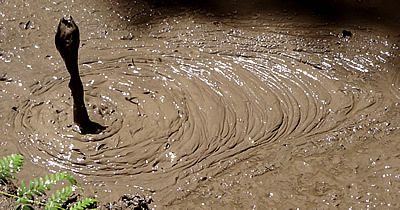 Volcanic mud rained down on the village, then arrived in boiling waves, burying the village and costing over 150 lives in the region.1 A small museum tells the story of the village and its destruction. 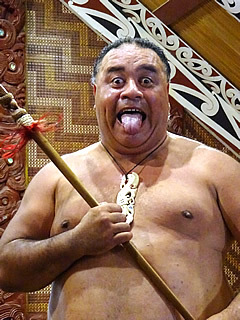 The Maori priest (tohunga) Tohuto Ariki, had prophesied a disaster as a result of changes in tribal life. 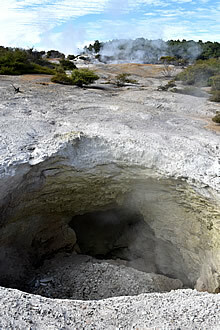 the people blamed him for the eruption and left him buried in his collapsed whare. Though he was pulled out alive four days later by Europeans, he died in hospital soon afterwards. 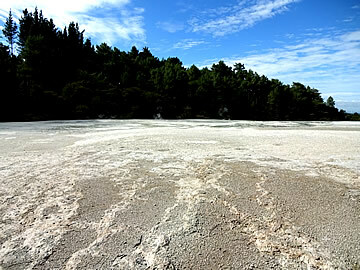 Prior to the eruption the area was famous for the pink and white silica terraces on Lake Rotomahana but these were destroyed. 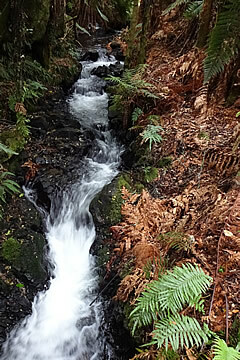 It's a very pleasant walk through native forest and, part of the way, alongside a stream. 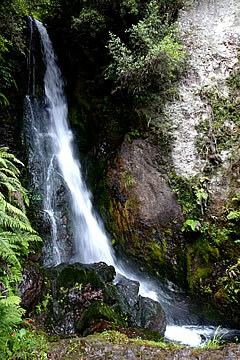 Towards the end there are extensive views over the forested valley. 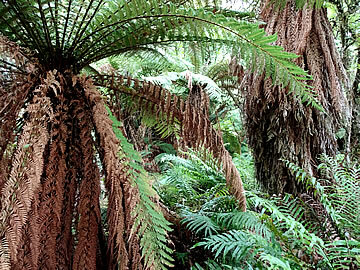 The cicadas were amazingly noisy here! 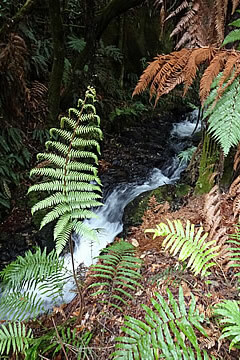 Lined with ferns and rushes, potatoes and kumara (a tuberous root crop) were stored here. We found the Buried Village to be an odd place, rather too pristine and lacking in atmosphere. 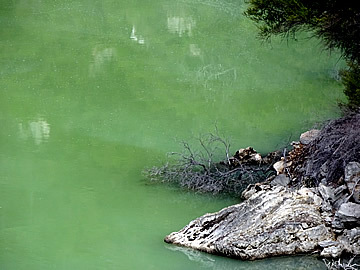 Though there are a lot of information boards dotted around the place with stories about what happened here, it was still hard to imagine it as a once-thriving Maori village devastated by volcanic action. 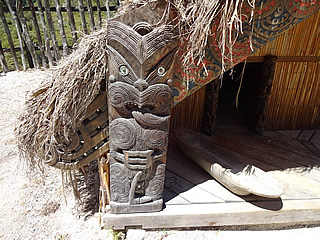 This is the bow section of a 30 ft. Maori war canoe. 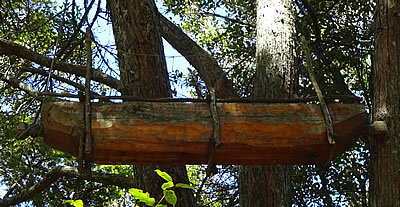 The canoe was made in three sections, lashed together with ropes. 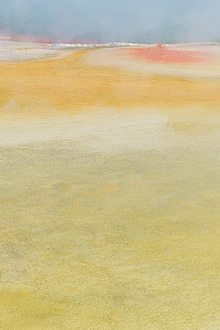 The canoe was made in sections so that it would be easier to transport over land. 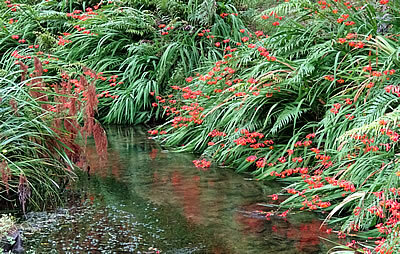 We saw these beautiful plants growing wild all over New Zealand. 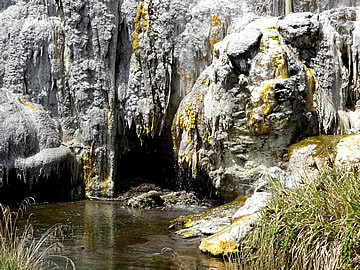 Discovered in the 1930s in the stream at the bottom of the waterfall. 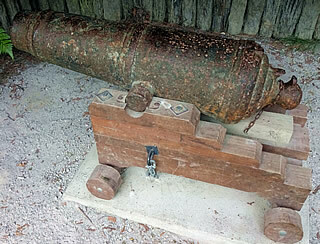 These ship cannon were first made by the Carron Iron Works in Scotland, designed to destroy masts and decks but not to damage the ship significantly as the aim was to plunder. 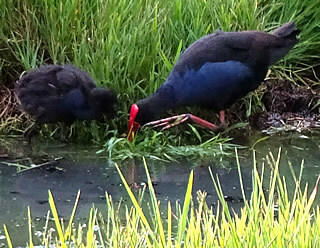 Australasian swamphen in Kuirau Park. 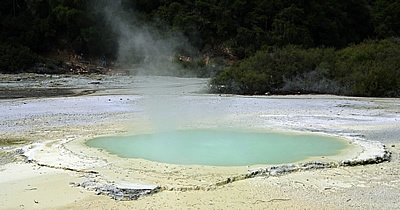 Rotorua is in a highly geothermal area characterised by hot springs, boiling mud, colourful mineral-rich waters and geysers. 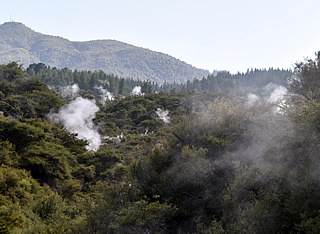 We didn't find the atmosphere too sulphurous, though the closer you get to the town's own geothermal Kuirau Park the worse it gets! 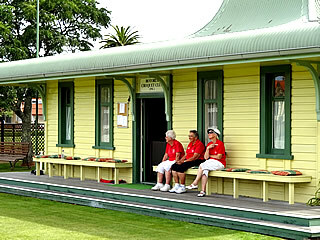 Ladies of the Rotorua Croquet Club. 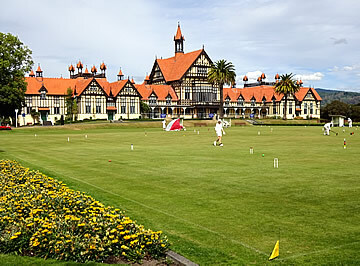 Croquet lawn in front of the rather grand mock Tudor museum, once a spa. 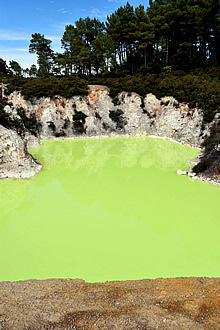 The museum was closed as its foundations were damaged in the recent South Island earthquake. 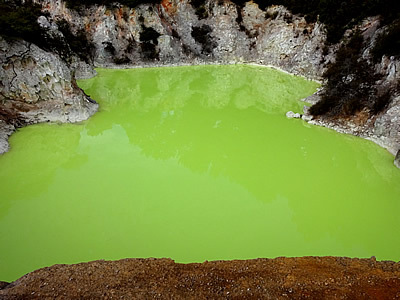 The town was first settled in the 14th century and called Te Arawa after the canoe which brought the Maori here from the Bay of Plenty. 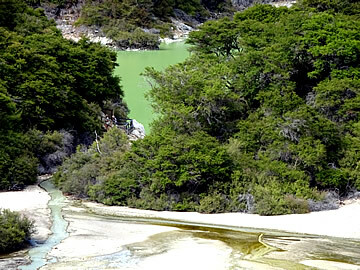 Te Arawa is also the name of the local Maori tribe. 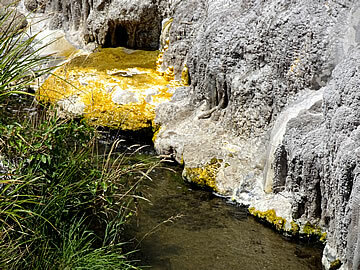 For us, and many visitors, the main attractions are out of town. We found parts of the town a little shabby, but the central area is nice with broad streets and we had an excellent hotel in the Quest Central. We had a large top floor studio apartment with small kitchen and full laundry facilities if we'd needed them! Tarakiki, fries and Good George IPA at CBK. 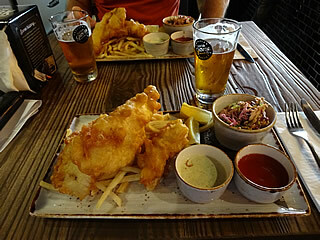 That first evening we ate on "Eat Street" at CBK - excellent Good George IPA to wash down tarakiki and chips - not quite as good as at Stoked in Whitianga but very nice people! 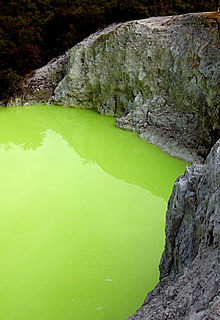 A crater which has collapsed due to the effect of underground acid on the rock. 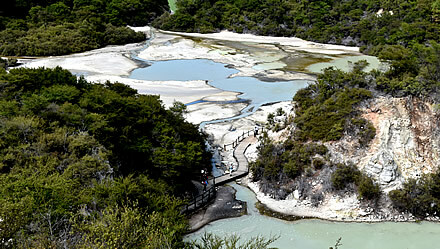 South of Rotorua Wai-O-Tapu, meaning Sacred Waters, is a fabulous feast for the eyes. 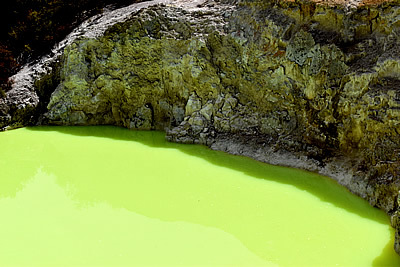 The colourful geothermal mineral lakes are other-worldly - oranges, yellows, lime green. 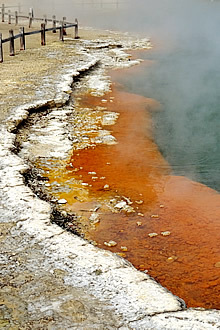 It's quite an extensive site and we spent three hours here. 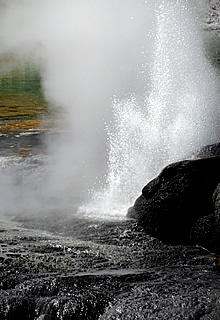 We did break it up by going to the Lady Knox geyser for its 10:15 appearance but this is a very stage-managed affair and we would not have been sorry to miss it. 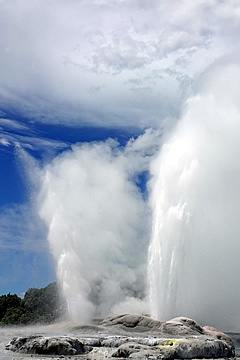 The spout is stimulated by using a surfactant to start it off, and it attracts a great crowd sitting on terraces to watch. 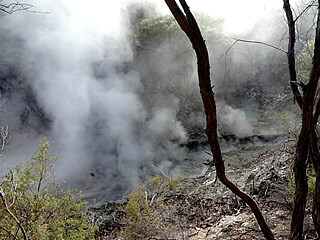 The ground really steams quite extensively! 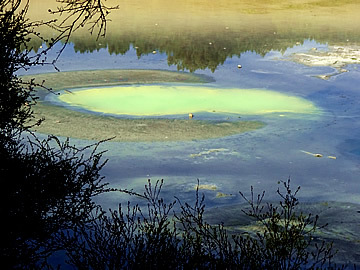 Much better to wander the trails, especially around the lakes. 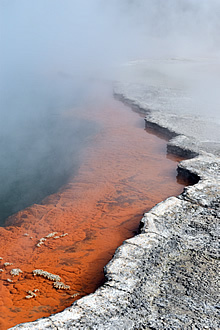 Artist's Palette - fed by overflowing water from the Champagne Pool on its right. 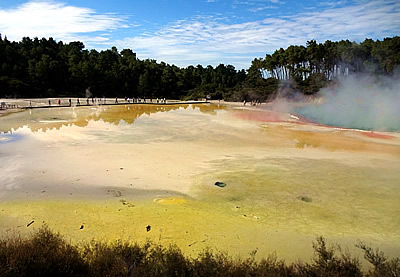 The Champagne Pool was formed by a hydrothermal eruption 700 years ago. 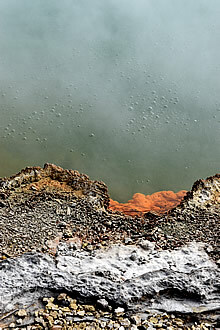 Its surface temperature is 74 °C; the bubbles are carbon dioxide. 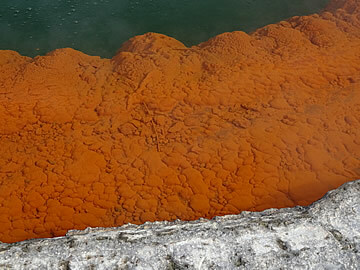 Its water contains gold, silver, mercury, sulphur, arsenic, thallium and antimony which are depositing on the deep orange sinter ledge. 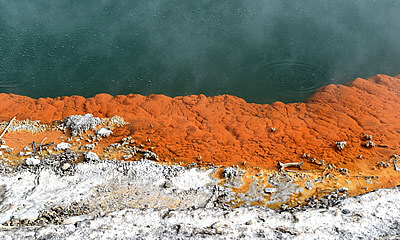 Champagne Pool on the left, Artist's Palette on the right. 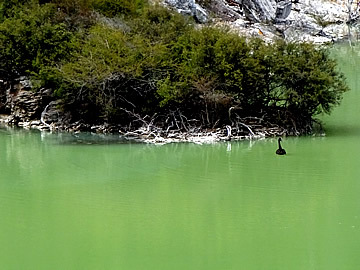 A black swan on Lake Ngakoro. 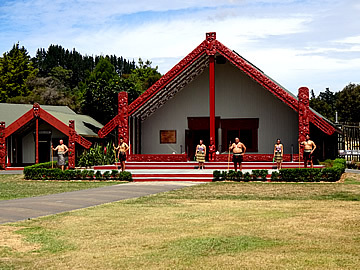 Te Aronui-ā-Rua - traditional style meeting house. 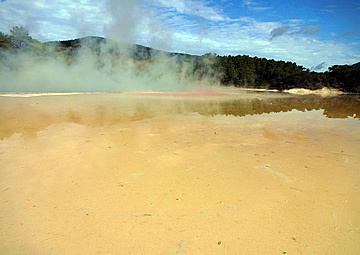 Te Puia is located in Te Whakarewarewa thermal reserve so it has extensive geothermal activity (and much better geysers than Wai-O-Tapu) but it also has the added attraction of Maori cultural activities (and a kiwi house!). 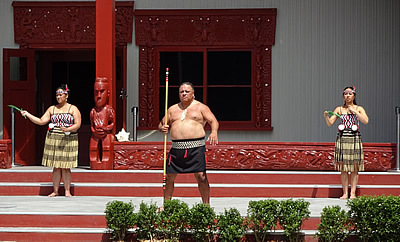 There is a small village, several shows every day and crafts plus the traditional Maori greeting and haka is performed outside the meeting house before every show. 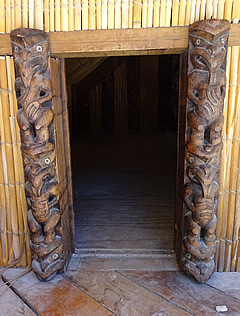 Traditional carving over the entrance to the meeting house. We also wandered into the meeting house where we were able to chat with some of the performers. They even gave us a bit of an impromptu performance! 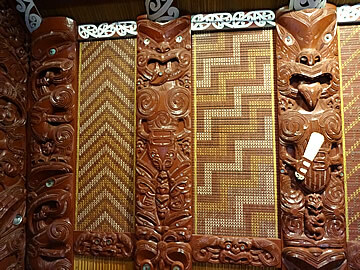 Traditional carved and woven decoration, in the Meeting House, created by students at Te Puia. 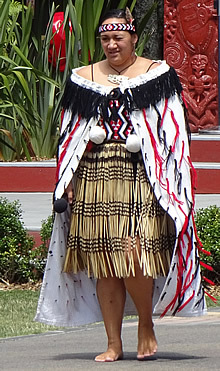 The traditional Maori welcome ceremony has its roots in military encounters when it was important to establish whether visitors were friend or foe. 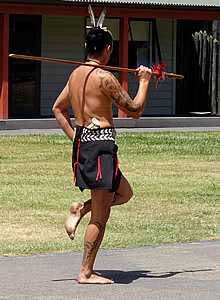 The powhiri begins with a warrior advancing and challenging visitors as in these three images. 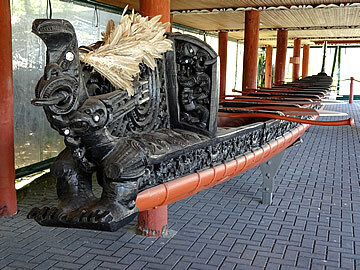 Wonderful carving on this war canoe. 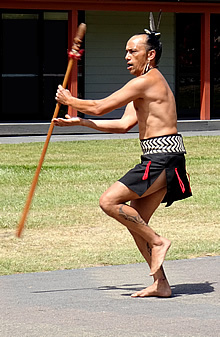 The Maori people are descended from Polynesian settlers who arrived on the North island probably around 1200 AD. 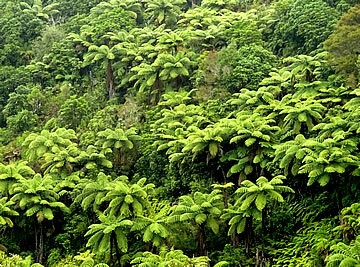 They quickly spread throughout both islands over the next hundred years. The warm coastal climate and abundance of game - totally fearless of man - aided their settlement. 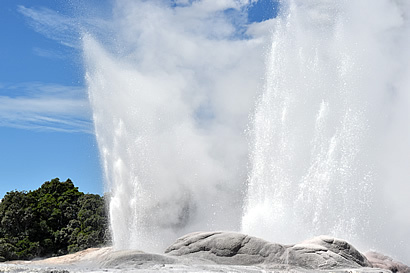 Though New Zealand has no native land mammals it was home sea mammals such as seals and flightless birds such as moa, which were about twice the size of an ostrich! 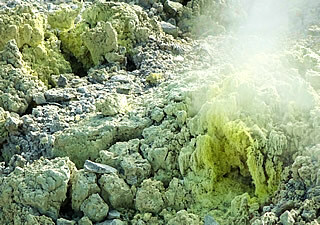 With success came population growth and eventually competition for dwindling resources leading to conflict. 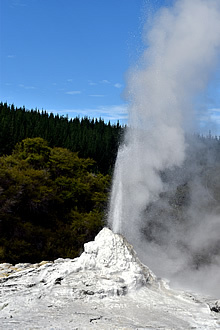 Europeans did not arrive until 1642 when a Dutch expedition challenged the traditional Maori "friend or foe" greeting with an aggressive blowing of trumpets. 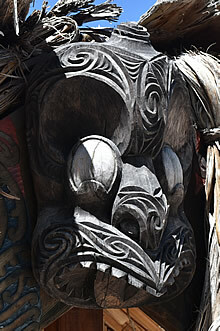 The Maori attacked, killing four ship's crew, and the Dutch departed without setting foot on land. 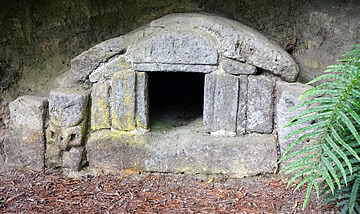 A carved food store, raised, presumably, to foil rodents. Europeans didn't return until 1769 with the arrival of the English sea captain James Cook, the most travelled explorer in history. He was the first European to land in New Zealand, the first to enter the Antarctic Circle and circle the globe there, reached many Pacific islands and even attempted to find the North West passage between the Atlantic and Pacific. 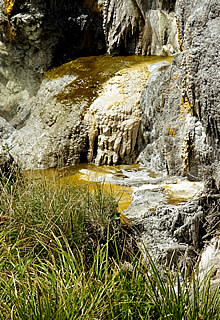 In New Zealand the British (and French) expeditions continued to explore, out of curiosity but also, of course, with an eye to profit. 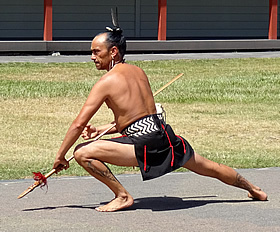 There was little conflict - Maori food and labour were traded for European goods, particularly muskets. Contact did, however, stimulate inter-tribal conflict - northerners, having the earliest contact, were able to use their acquired firearms to attack southerners - the so-called "Musket Wars" of 1818-36. It was only when virtually all tribes had muskets that the wars petered out. 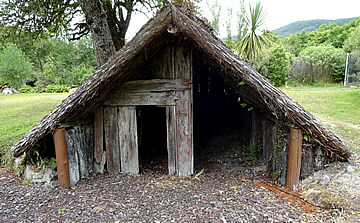 Another elaborately carved village building - it could be the chief's whare. 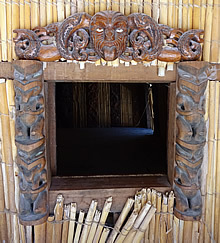 The posts either side of the entrance and the window frame are all carved. 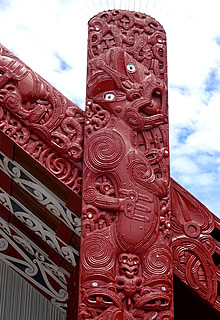 Carving above the centre pole of the front of the whare. 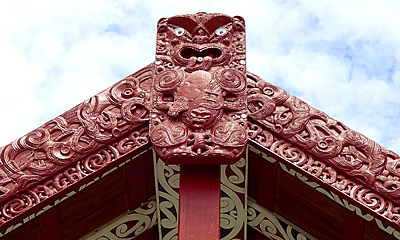 Pikirangi village in Te puia has lots of the impressive Maori carved wood adorning village buildings. 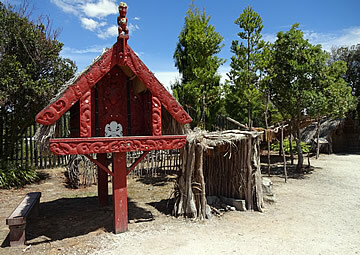 The homes (whare) are low to the ground and thatched and the village is surrounded by a wooden palisade. 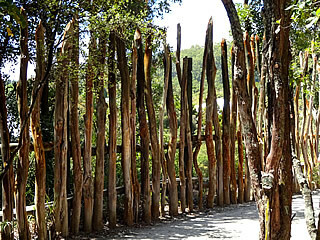 Wooden palisade around the village. 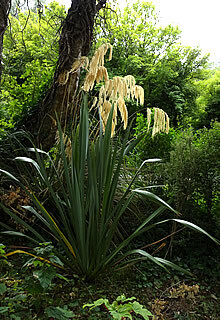 Along with birds, Maori would traditionally catch fish (which was often filleted and dried) and grow root vegetables. 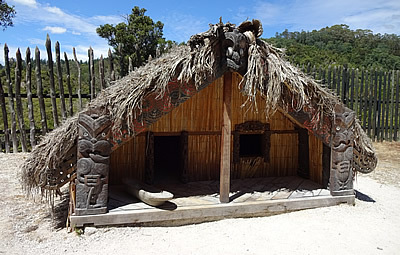 Food was often cooked in an underground pit, known as a hangi - food was placed on hot stones and covered with a cloth and leaves and earthed over - we saw something very similar in Curanto in Chile. 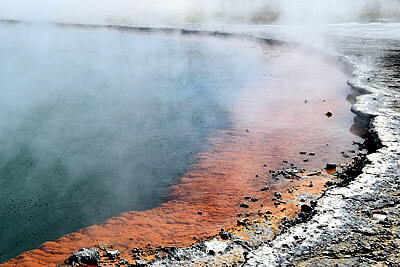 In geothermal regions natural steam could also be used. 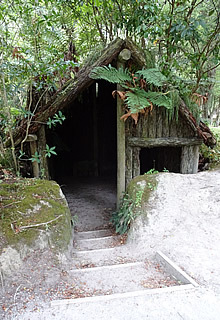 The kiwi house was a highlight - the only possibility we had to see kiwis. 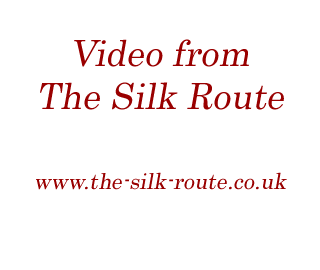 It's quite difficult, and almost impossible in the wild, as they are nocturnal creatures. The kiwi house was extremely dark and it took a while to get accustomed to the very low light level but once we did we could make out one of the two brown kiwi they have here, rooting around in the leaf litter with its long beak, a large puffball of long narrow feathers. 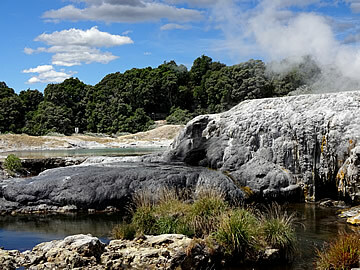 Te Puia has some great bubbling mud pools and fantastic geysers. 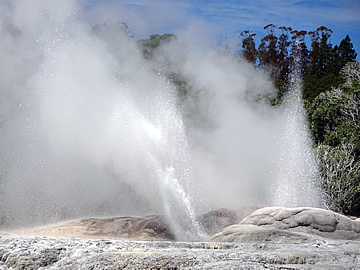 Te Tohu geyser on the left and Pohutu geyser on the right. 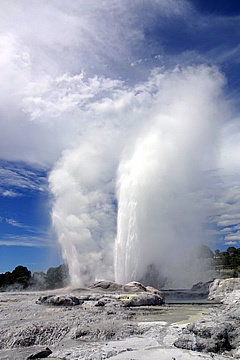 Two fantastic geysers erupt on a white rock promontory: Te Tohu, also called "Prince of Wales Feathers" after royal guests noticed a resemblance, can reach up to 7m; Pohutu, which means "constant splashing", erupts twice every hour and can reach a height of 30m.